The Nauty’Mor shipyard equipped by Nautipark! 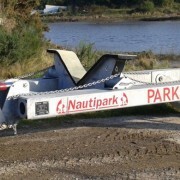 Nauty’Mor shipyard in Hennebont recently equipped itself with the Parklev 15T, in keeping with its development. Like them, we are delighted to contribute to the safety and comfort of their boats. https://www.nautipark.com/wp-content/uploads/2015/11/20151019_173601-1160x390.jpg 390 1160 Anne-Laure https://www.nautipark.com/wp-content/uploads/2015/04/logo-Nautipark.png Anne-Laure2015-10-31 12:08:032017-07-27 14:37:07The Nauty’Mor shipyard equipped by Nautipark!